Alsatian deputy of the French National Assembly from 1789 to 1791, and its president in the latter year; born at Colmar Oct. 8, 1747; died there Nov. 23, 1807. 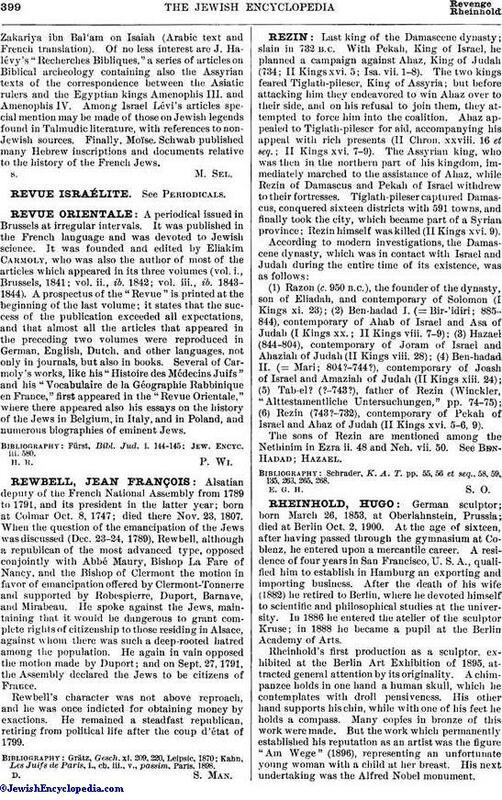 When the question of the emancipation of the Jews was discussed (Dec. 23-24, 1789), Rewbell, although a republican of the most advanced type, opposed conjointly with Abbé Maury, Bishop La Fare of Nancy, and the Bishop of Clermont the motion in favor of emancipation offered by Clermont-Tonnerre and supported by Robespierre, Duport, Barnave, and Mirabeau. He spoke against the Jews, maintaining that it would be dangerous to grant complete rights of citizenship to those residing in Alsace, against whom there was such a deep-rooted hatred among the population. He again in vain opposed the motion made by Duport; and on Sept. 27, 1791, the Assembly declared the Jews to be citizens of France. Rewbell's character was not above reproach, and he was once indicted for obtaining money by exactions. He remained a steadfast republican, retiring from political life after the coup d'état of 1799. Kahn, Les Juifs de Paris, i., ch. iii., v., passim, Paris, 1898.